You have a city with a genuine bona fide football hero. A man that put a medium-sized provincial city on the world map of football and became the biggest thing since Robin Hood. After a protracted spell of hard work in fund raising, fully £70,000 is collected to commission an excellent tribute to the man in question – a permanent memorial for all to enjoy in a busy area of the city. Then some numb nut decides to vandalise it after only a few short months. The statue of Brian Clough in Nottingham lasted intact from last November until this week. Sadly I think we all knew it would happen some time. Thankfully the wrong has now been put right. There was a lot of consideration as to where to site the statue. One problem at the time was that Nottingham Forest were actually talking about moving grounds. 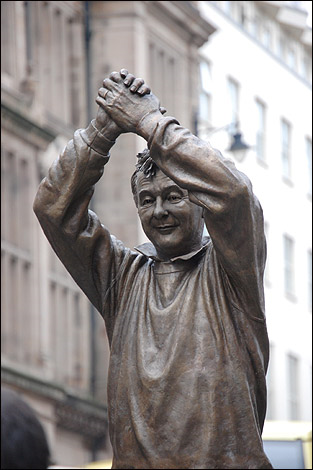 It was decided that the statue should be in the centre of the city where everyone could enjoy it – not just visitors to the City Ground which is a short bus ride out of the city. On balance I’m glad they put it where they did. I walk past it frequently in the city and always have a peek at Brian and a wry smile to myself when thinking of him. The statue brings back many happy memories. This Clough statue incident is one of sheer wanton and mindless vandalism. Quite likely attention-seeking behaviour too. i think this person will get his come-uppance though. It might have the useful side-effect of focusing local peoples’ thoughts on the problems of vandalism too. I finally got to a screening of the long-awaited The Damned United at the excellent Broadway Cinema in Nottingham last evening. After reading the recent good reviews of the movie I was not disappointed with this 1hour and 38 minutes of pure 1970s’ football nostalgia. 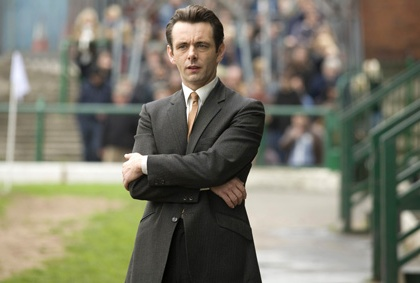 As a resident of Nottingham and a football fan who lived in Nottingham through Brian Clough’s long reign at Nottingham Forest’s City Ground, I was interested to see how much the partly fictional film measured up to my perceptions of Brian Clough and his partner, Peter Taylor, not to mention the various football luminaries of the era that I remember so well. It has been said that Brian’s widow, Barbara and family were unhappy about the way the great football manager was portrayed in the original book and without having read the book, that is fairly lamentable I feel. It’s an issue with which I have some sympathy. Recently Brian’s family stated that they were consulted prior to the making of the movie however and I hope that they were happier with this portrayal of both the man and the era. Certainly I found Brian’s character, although young and brash as he undoubtedly was, difficult not to like. It seemed essentially a lot like the man I recall from that time, though doubtless there were inaccuracies, as in any re-telling of a story. This informative interpretation, reflecting on Clough’s 44-day stay at Leeds United before his ignominious sacking should perhaps not be viewed in isolation in that way. This past week has seen the displaying of three miniature bronze statues of Brian Clough in Nottingham’s Council House with people being offered a few days in which to appraise the different works and to help choose which will be finally commissioned.Three artists, Les Johnson from Hampshire, Keith Maddison from Northumberland and John McKenna hailing from Ayeshire are competing for the honour of portraying the ‘Master Manager’ and have created statues and busts of the great man.